Thanks to Scragz - Original poster's identity kept anonymous to protect the secrecy of their lurve for the subject! The fur stole's not helping, but the combination of summer sun and tightly laced corset is MAKING HER EYES BLEED! BLEED I TELL YOU! only a 7 for gothiness? this girl is as goth as it gets. 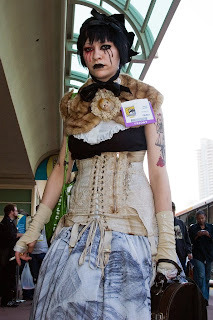 Too much hentei at comicon made her eyes bleed. That's the breaks. Note the San Diego Comic Con badge and the obvious San Diego Convention Center roof in the background. This photo was taken in San Diego sometime around late July. Since she's at Con, not only is she dealing with southern california summer heat, but she's also surrounded by thousands of other sweaty nerds in a confined convention floor space. I'd chock the sweatiness factor of this up to 9 if I was you. I'm glad I'm not the only one whose first thought after looking at this photo was "omg Comic Con I remember the roof!" Comic convention indeed. look at the pass. Wow, I was there too and I missed that! How?! I really hope she's dressed as something Anime-esque because that just doesn't look good (imho). Ah, CCI SD. The finest excuse to wear really bizarre pseudoclothes ever invented. The color scheme dissonance actually makes me snicker a bit and the creepyface doll head cameo...I'm so making one of those once I finish my face-shaped pincushion bracelet. The massacred fake'n'bake corset though...That ruins it for me. Those things hurt and are ugly. Add: The worst part is that you can tell she spent forever putting all that stuff together.